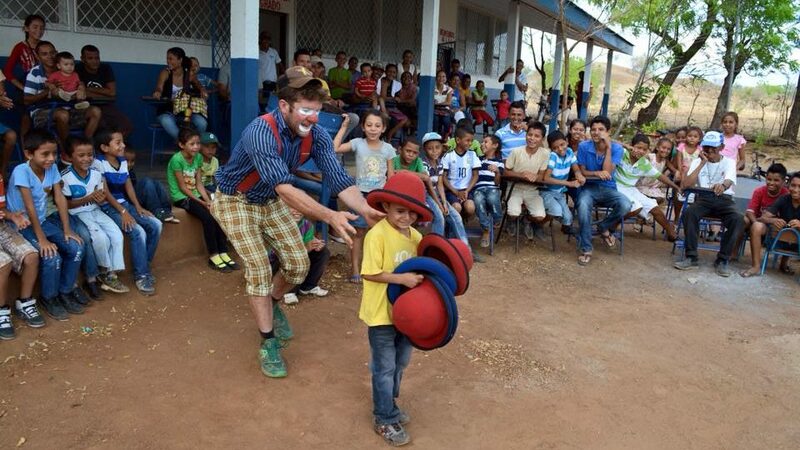 Clowns Without Borders USA began our service in Nicaragua in partnership with local non-profit Fundacco – a grassroots organization that organizes to promote hope through community development and the organization of populations for a more humane future for all. With a surface of 129.490 km2 and an estimated 6 million people, the Republic of Nicaragua is the largest country in Central America. Managua since 1852 has been a capital city with about 2 million people living in the metropolitan area, followed by Leon, Masaya and Tipitapa, all with more than 120,000 population. Nicaragua has borders with Costa Rica in the south and Honduras to the north, the Pacific coast in the west and the Atlantic coast to the east. The country is divided into 15 administrative districts and two north and south on the Atlantic coast autonomous regions. Lake Nicaragua (Nicaragua) and Lake Managua (Xolotlán), the country has two large lakes of which Lake Nicaragua is the second largest in Latin America. In the Pacific region is a chain of 19 volcanoes that runs through it from north to south, of which 4 still had eruptions in the last 15 years. One of them is the Concepción volcano on Ometepe Island. A few kilometers offshore from the Pacific coast, the Caribbean plate meets the plate Coco and both movements can cause earthquakes occasionally throughout Central America. All these geographical features and its location on the map make Nicaragua is part of the Pacific Ring of Fire. According to statistics, Nicaragua is, after Haiti, the second most poor of Latin America and the Caribbean. The national currency is the Cordoba Oro, though large transactions are usually handled in US dollars. Nicaragua’s leading exports are coffee, snuff, cocoa and meat. The crop products such as beans, rice, corn, bananas, etc. are more important planted and negotiated within the internal market of the country. Fishing, mining, and timber also take part in the economy and tourism, which progressed rapidly in recent years. With the exception of a small percentage of the population, Nicaragua has a high poverty rate and suffers from extreme poverty. Even as conditions improve slowly, a large part of the society survives only thanks to remittances from relatives living and working in other countries. The government has begun useful social programs rural areas, invested in infrastructure for transport, education, industry energy and tourism throughout the country, foreign investments are growing and new trade agreements with other countries have been signed in recent years; there is still a long way to see a significant change in the image of Nicaragua economy and welfare for much of Nicaraguans. The country’s wealth is distributed only to a few.